A marvel of small space engineering, the Miles pub set in black pine proves less is more. This retro-modern set includes two round stools and round drop leaf table which opens for dining. A drawer and bottom shelf provide much-needed storage. 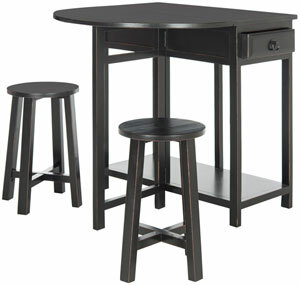 Dimensions (W*D*H): TABLE: 32" x 32" x 32.7"; CHAIRS: 11.5" x 11.5" x 19.7"